The general public is not aware of the problems the mining industry faces today. The remedy is the “2015 Minerals and Mining Regulatory Reform Act—A Clear Path Respecting Mining Rights,” written by miners, for miners, insuring regulatory certainty. The National Mining Association’s (NMA) data has not been adequately addressed in Amodei’s bill, which the “2015 Minerals and Mining Regulatory Reform Act—A Clear Path Respecting Mining Rights Bill” does address. Senator Lisa Murkowski’s bill, the “American Mineral Security Act of 2015,” is another bill that would provide some relief to regulatory overreach. Again, while we sincerely appreciate her efforts, there are some regulatory burdens that are not adequately addressed. The “2015 Minerals and Mining Regulatory Reform Act—A Clear Path Respecting Mining Rights” creates and insures regulatory certainty. Thousands of hours have been invested to get the bill to this point. The time is right politically to get this bill passed. Through mining contacts, quite a few members of Congress and the Senate have already expressed their support. Now we need your help. Please take the time to review the latest revision of the “2015 Minerals and Mining Regulatory Reform Act—A Clear Path Respecting Mining Rights” online at www.mmacusa.org. 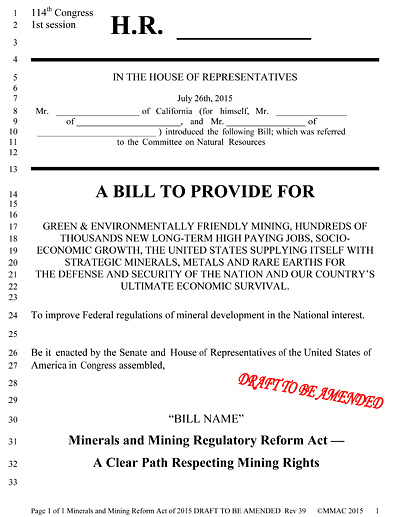 Print a copy and take it to your Congressmen, Senators and Governors and tell them what we, the American mining public, want and need their committed support. Congress is out of session for the month of August. Please make an appointment with your elected officials and deliver them a copy of the “2015 Minerals and Mining Regulatory Reform Act—A Clear Path Respecting Mining Rights” and let your voice be heard. We have the opportunity -- right now -- to fix many of the problems associated with overbearing and duplicative regulations, excessive land use restrictions and overzealous regulators at the county, state and federal level. Read the proposed bill. It addresses all of these issues. Then please take advantage of this opportunity and print out a copy, make an appointment with your legislators, and talk with them about it. You can do this by yourself. If you are not confident in your speaking abilities, make an appointment as a group with other small or large scale miners in your area. There is strength in numbers. Let's not miss out on the opportunity while the political climate is right. County, state, and federal agencies (i.e. the US Forest Service) could be out of the business of regulating prospecting and mining by early 2016 with your help. Think about that. Read the bill, contact your legislators, and respectfully urge them to support it.